Aluminum alloys Al-Mg-Si are increasingly used as car bodies substituting heavier metals based on economic and political pressure which calls for the reduction of fuel consumption and CO2 emission. In Europe, the automotive industry has increased the average usage of Al alloys in passenger cars during the last decades. The performance of the alloys depends heavily on the design of the thermo-mechanical processing route, e.g. the formability depends on the rolling schedule and annealing temperature while the final strength depends on the annealing and quenching conditions coupled with successive pre-ageing and paint baking treatments. Among commercial aluminum casting alloys, those with silicon as the major alloying element are the most important, mainly because of their excellent casting characteristics. Additions of Si to pure aluminum impart high fluidity, good feeding characteristics, low shrinkage and good hot cracking resistance. The high strength to weight ratio is one of their most interesting characteristics. As the density of Si is 2.3 g/cm3, it is one of the few elements which may be added to aluminum (2.7 g/cm3) without loss of weight advantage. Aluminum-silicon alloys that do not contain copper additions are used when good castability and good corrosion resistance are needed. Magnesium can act as a substitute for copper. 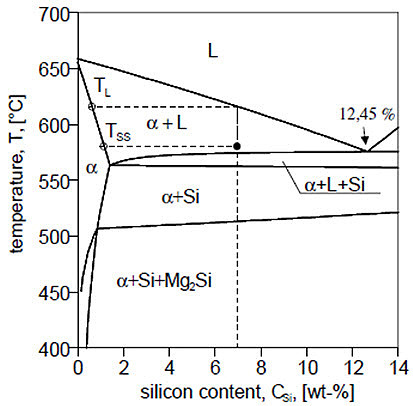 Magnesium and silicon can form the intermetallic hardening phase Mg2Si which precipitates in the α-aluminum matrix and increases the yield strength. Figure 1 illustrates a pseudo-binary section through the system AlSiMg0.3. The temperature interval of solidification is about 60°C and the semi-solid forming temperature, TSS, at a liquid and solid fraction of ca. 50% can be detected to ~580°C. On the other hand, it is a fact that the yield strength can be increased by an increase of alloyed Mg. 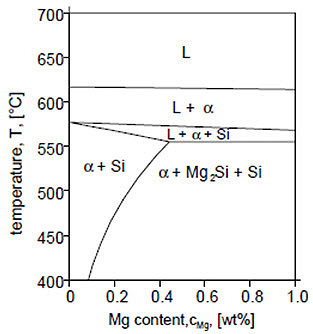 The maximum amount of Magnesium which can be dissolved in α-aluminum at simultaneous presence of Si and Mg2Si is between 0.45 wt% (Figure 2) and 0.75 wt% (Figure 3) at 555°C. Magnesium which cannot be dissolved in the matrix is available for the formation of undesired intermetallic compounds. Impurities like iron, which is the most deleterious impurity for AlSiMg alloys, form various intermetallic compounds with Si and Mg such as α(Fe2SiAl8), β(FeSiAl5) and π(FeMg3Si6Al8). Among these compounds, the formation of plate shaped β compounds reduces the mechanical properties, particularly ductility and fracture toughness. The size and the volume fraction of the β plates depend strongly on the Fe content, solidification rate and level of modification. The β-phase – π-phase transformation is dependent on the Mg content. As long as β-FeSiAl5 is the Fe bearing phase all the Mg will be in solid solution. Further additions of Mg will first lead to transformation of the β-AlFeSi into π-FeMg3Si6Al8, while the concentration of Mg in solid solution stays constant. When all the β-FeSiAl5 has been transformed, additions of Mg will give increased Mg in solid solution, with π-FeMg3Si6Al8 as the only Fe-bearing phase. Taylor et al. report a transformation of π-phase to β-phase in low Mg alloys (0.3-0.4%). In alloys with higher Mg content (0.7 wt%) the larger π-phase particles are more dominant. 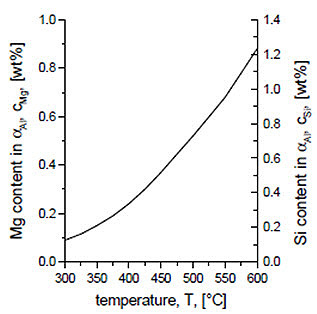 While sharp edges of β-FeSiAl5 plates act as stress raisers with detrimental consequences for the ductility, the π-FeMg3Si6Al8 phase has less negative effect on the ductility, because larger amounts of Mg are consumed in forming these constituents and therefore the amount of Mg available for forming Mg2Si precipitates is reduced, resulting in softening of the matrix. Excellent castability, corrosion resistance and high strength-to-weight ratio (which increases performance and fuel economy) have made cast Al–Si–Mg alloys suitable candidate materials for various applications in the automotive industry, such as engine blocks and cylinder heads. The main limitations of Al-Si-Mg cast components are due to the considerable influence of the solidification conditions on the final microstructure. The final cast component inevitably contains a certain number of defects such as oxide films, shrinkage and gas porosity, which significantly affect the mechanical properties and in particular the fatigue behavior.